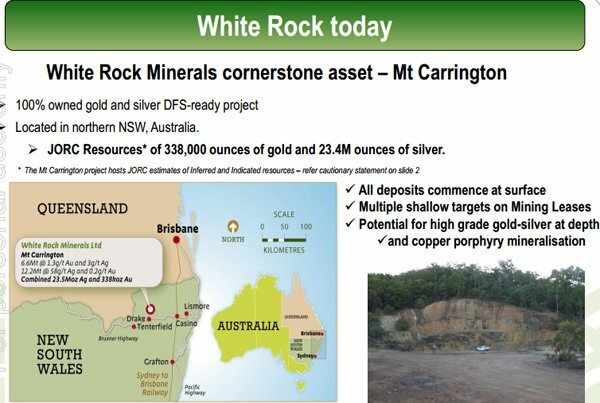 The good news continues to flow at White Rock Minerals (ASX:WRM) with the company announcing on Monday morning that it had raised $2.5 million to progress its Definitive Feasibility Study (DFS), Environmental Impact Statement and associated approvals in relation to the group’s Mt Carrington project. Management also indicated that the funds would assist in providing ongoing working capital. The placement price of 1.5 cents is broadly in line with where the company was trading a fortnight ago, and a 15% premium to its mid-November range. Notably, in the first half hour of trading on Monday morning, WRM’s shares traded at a premium to the placement price, at one stage hitting 1.9 cents, representing a premium of more than 25%. It should be noted here, that those considering this stock shouldn’t make assumptions regarding exploration outcomes only, nor should they base investment decisions on performances and share price movement to date. Investors considering this stock for their portfolio, should seek professional financial advice. This represents strong support for a junior miner, in a sense not surprising given the Mt Carrington project has attractive financial metrics and is being shaped by some very experienced identities in the mining industry. Chief executive, Matt Gill has a wealth of global experience, and he made the following comments in relation to both the October placement and recent raising, “These equity raisings represent a game changer for White Rock as it will now be able to advance the current Mt Carrington scoping study to Definitive Feasibility Study level, and progress the necessary permitting through completion of its Environmental Impact Statement”. From an operational and strategic perspective, Gill highlighted the fact that once these were completed and subject to certain conditions precedent, the proposed US$19 million financing package offered by Cartesian Royalty Holdings would enable the group to build and commission the mine, unlocking the full potential of the Mt Carrington gold/silver project where a strong resource base of 338,000 ounces of gold and 23.4 million ounces of silver has the potential to support a mine life of more than seven years. Also working in WRM’s favour is the fact that there is existing infrastructure in place, providing a clear sight to the construction and production phase. WRM is well diversified with Mt Carrington offering leverage to precious metals, while its Alaskan based Red Mountain project provides exposure to zinc, copper and lead, as well as silver and gold. It is also close to extensive mining infrastructure, and near surface high grade exploration results suggest there is scope to expand the project into a sizeable zinc silver operation. 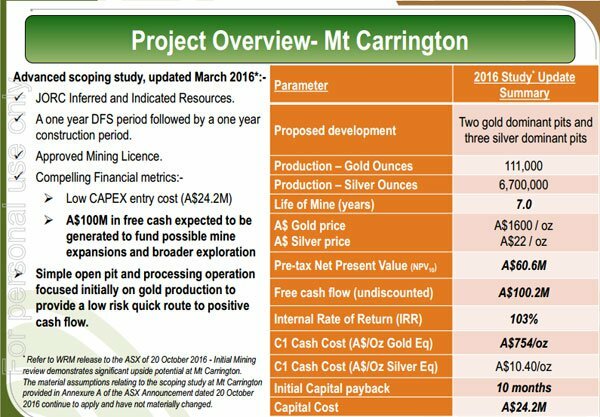 Harking back to Mt Carrington, the metrics certainly stack up well with the 2016 scoping study pointing to projected free cash flow of more than $100 million. Importantly, the Australian dollar gold price used in the scoping study was $1600 per ounce. The current spot price is circa $1600 per ounce. For every AU$100 ounce movement, free cash flow over the mine life is impacted to the tune of $6 million. Similarly, the Australian dollar silver price is currently in the order of $22.50 per ounce. 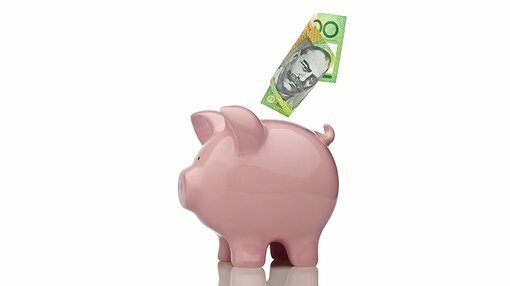 The scoping study was based on a price of AU$22 per ounce, indicating that free cash flow over the life of mine is approximately $3 million higher than indicated in the scoping study. The following provides a useful snapshot of the Mt Carrington project. Key metrics to consider are the short payback period (10 months) extremely high internal rate of return (103%) and the strong margins that exist taking into account the difference between commodity prices and C1 cash costs. WRM will undergo a one year DFS period.